Have you ever wondered how to serve a fish meal to a hungry family when you only have one or two? 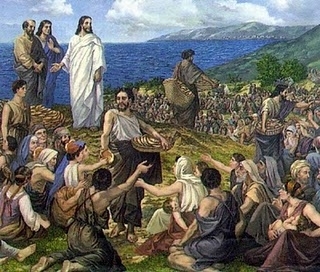 Jesus managed to feed five thousand followers by the Sea of Galilee with two fish and five buns, but He used miracles. This is a recipe that does not involve cheating. It doesn’t exactly feed people either, but it makes a nice starter and leaves them happy. Use plaice, dabs, flounder, small pollack, bass, whiting, cod or similar. Make an Indian batter by measuring about 50g of gram (chickpea) flour, which you can buy in the better supermarkets these days. Add a teaspoon of salt and a teaspoon of garam masala. Mix with enough cold water to make a batter the consistency of thick cream. Heat a pan of oil to frying temperature, which you can measure by dropping a small cube of bread in and if it goes nicely brown in 30 seconds its fine. The oil only needs to be a couple of cms deep.